I’ve seen photos where people use a leash attached to a dog’s collar in the car. I don’t like this idea. If the car stops suddenly or if there’s an accident, the collar could choke the dog – or worse, snap its neck. The hammock also helps in this regard. If the car would stop suddenly, Dixie couldn’t fall to the floor of the back seat area as the hammock curves up to the back of the front seats. However, I still didn’t want to take any risk of her getting tangled or choking. I do like the idea of a short leash attached to a harness. Dixie quickly illustrated why – by climbing under the hammock in the back seat – then into the front seat – then into my lap. Thankfully, the shelter is only 1.5 miles from my house, so it was a very short trip. One of our first adventures was walking to a nearby pet store and purchasing a harness. I also ordered a special seat belt leash. I think a short traffic leash (with the seat belt inserted through the loop handle) would have worked as well. I keep our seat belt leash attached to the back seat seat belt in the car, making my life pretty easy. Dixie jumps in the car, I attach her seat belt leash to her harness (NOT her collar) – THEN I remove her walking leash. Likewise, when we arrive, I ask her to “wait”, I attach her walking leash to her harness – THEN I remove her seat belt leash. (As a small dog, I also prefer a harness to a collar for walking. She has a fragile throat and my vet commented on how glad she is we’re using a harness. She’s seen too many throat injuries just from a handler snapping the leash attached to a collar on a small dog.) The short seat belt leash allows Dixie to move about a little in the back seat – laying down, or peeking out the back seat windows – but does not allow her enough room she can climb into the front seat and distract me from driving. I suspect Dixie likes the car. Almost every time we go outside, Dixie goes to the garage side door and waits, hoping I’ll open it. At first, I thought she wanted me to take her back to the shelter, and I was a little sad about it. However, by now I’m convinced she knows this is her forever home – and she’s just hoping we’re going on an adventure in the car. Another lesson learned, the hard way. I lock the doors and windows. I learned this lesson the hard way when Dixie rolled down a back window in order to curse (bark) at a woman walking down the sidewalk. Thankfully, her seat belt leash prevented her from jumping out that window if she’d tried to – but I don’t want to take any risks with my precious cargo. Dixie and I always start every venture out of the house with a stop in her “potty place” where I wait until she urinates to continue – whether it be for a walk, car ride, or just playtime in the backyard. I had hoped this would prevent us being one of those dog and handler couples standing outside for ages, begging for “potty”. I had read that taking a dog inside immediately after elimination can lead to the dog “holding it”, resisting eliminating to maximize their time outdoors. This further reinforced, for me, that Dixie get something enjoyable (a walk, car ride, or playtime) after she eliminates. While there’s the occasional exception, I try to stick to this routine of potty, then fun. Dixie resists defecating in the back yard, so she usually waits to do that on our walk. That’s okay. I originally tried to teach her to poop in the back yard as well as pee, but it just led to confusion. The first time I tried, she peed… we didn’t go on our walk… she tried to pee again? She looked at me confused. I took her inside. She pooped on the kitchen floor. I learned with my cats – pick your battles. Pooping outside while on our walk – I can live with that. Dixie has been whining a bit in the car lately. 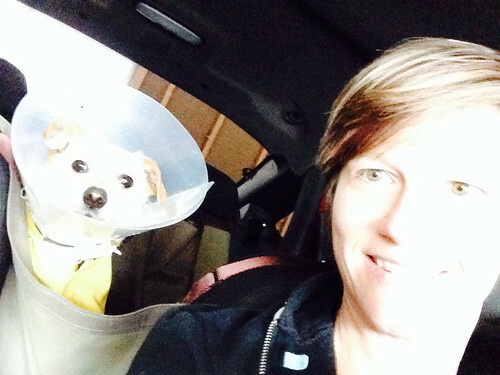 I suspect she’s either unhappy with the cone interfering with her enjoyment – or the leash restricting her activity. Other than a bit of whining, and two small vomit episodes, she’s seemed to do well with the car. She still seems anxious to get into the car – and particularly excited if we’re getting out near the park.